Supplied with carry case and extra-reach cable. The heavy-duty RAGE8® cuts metal conduit, copper pipe and PVC tubing, as well as wood, nail-embedded wood and plasterboard. The high-powered, high-speed RAGE8® is the ideal saw used by demolition and construction workers, fitters and emergency crews. 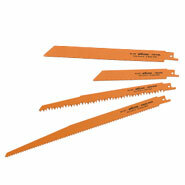 Flush cutting is only possible when using the highly flexible bi-metal blades supplied. These allow you to cut-off unwanted protruding material such as redundant joists, brackets and pipes very close to a surface, for an amazing flush-finish. The RAGE8® is work-saving and perfect for plunge cuts on soft building materials such as plasterboard, where electrical socket holes are required - time to drop the tedious hammer and chisel method! This adjustable metal pivot plate is large and stable. It allows the possibility to adjust the angle of sawing in order to achieve optimum cutting efficiency and minimise vibration, blade jumping and/or breakage. 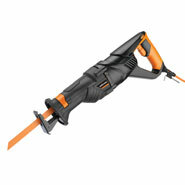 Delivers a variable 800-2400 strokes per minute and a 28mm (1-1/16") stroke length for making fast, efficient cuts. The variable-speed above the soft-grip handle offers you the control you need to make precise cuts. Four blades engineered for different materials are supplied as thin steel, multipurpose for demolition work, green wood for tree-limb cutting and a clean-wood cutting blade for smooth cuts. Simply lift the lever and slot in the blade - quick and easy! When you can buy a RAGE8® Multipurpose Reciprocating Saw!